One minute it is sunny and warmish, the next minute the sky is bleakly grey and the wind is cruel. How exactly does one dress successfully for that insanity?! 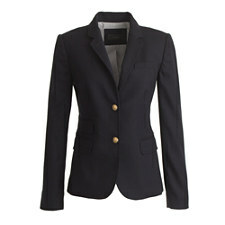 Answer: the navy blue blazer. Classic and ridiculously versatile! T-shirt, jeans and slip on jeans, culottes and stillettos, cigarette pants and kitten heels + navy blazer = perfect Spring outfit options! 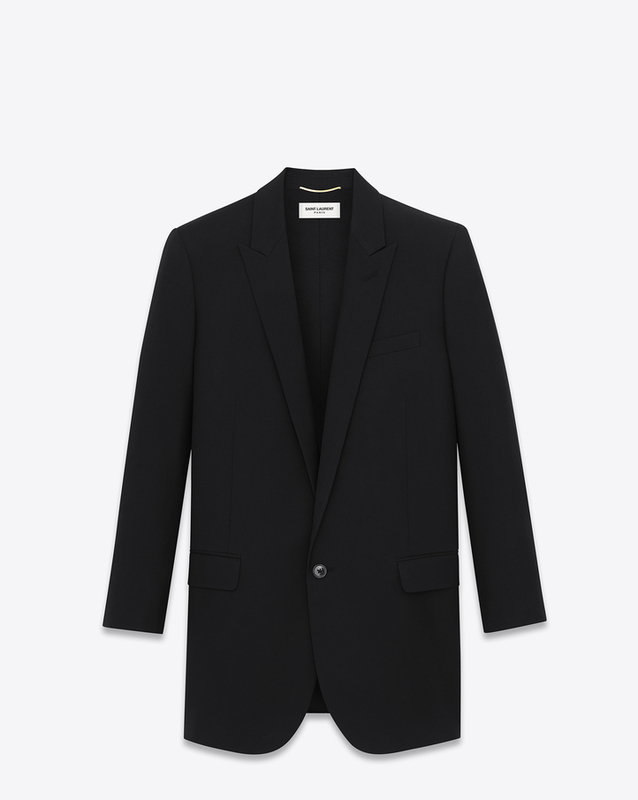 Price points are just as varied, from $3190 for Saint Laurent’s wool gaberdine gorgeousness to a sweet $138 deal at J Crew. reversecommuter invested in a Ralph Lauren Collection blazer a few years ago and it was worth every single penny! A classic fine tailored piece will last for almost ever, and every single time it is worn it makes me smile. 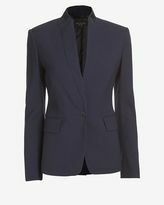 Smythe (a Canandian jacket designer) offers up a multitude of styles and interpretations of the navy blazer every single season. LOVE! 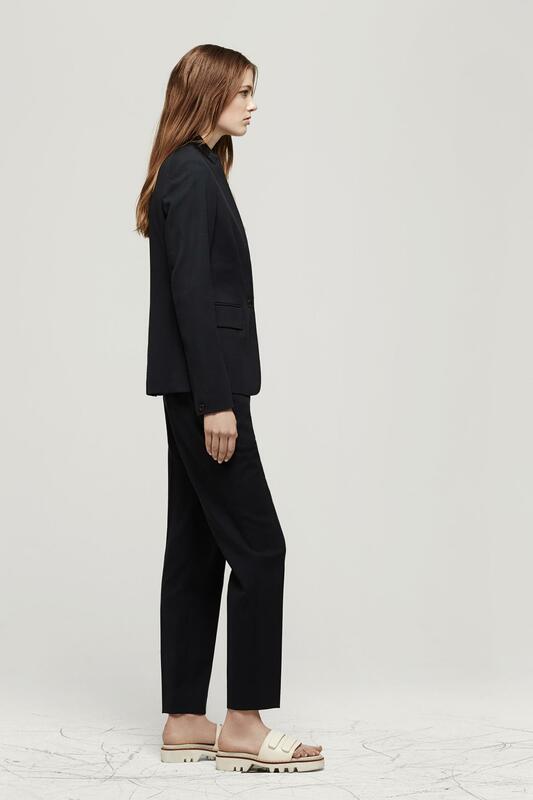 Theory has a clever take on the classic this Spring. 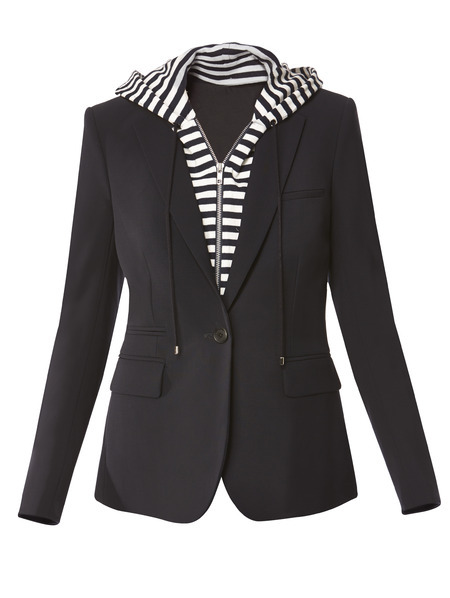 Rag & Bone’s genius blazer design stuns and introduces fun elements such as piping and gorgeous big buttons. The navy blazer is the ultimate unknown element piece that makes for the perfect airplane item, warm enough for the inevitable airplane air conditioning arctic blast (WHY do they do that?!?!?) and yet is warm enough to not melt you en route to your oceanfront hotel! Obviously Veronica Beard’s dickey blazer would be THE ultimate piece for this journey – just zip off the dickey before the plane lands! This entry was posted in accessories, age appropriate clothing, Bergdorf's, Boston blog, Boston fashion, Boston fashion blog, Boston fashion blogger, Boston suburb fashion, CFDA, children, clothing, Fashion, Fashion blog, fashion blogger, Finance, jeans, kitten heels, Magazines, Media, mommy blog, mommy blogger, mommy fashion, mommy fashion blog, mommy fashion blogger, Shoes, social media, stillettos, style and tagged blastmagazine.com, blazer, Boston, boston fashion blog, Boston fashion blogger, Boston suburban fashion blog, CFDA, culottes, Facebook, fashion blog, fashion blogger, fashion editor, gaberdine, Instagram, J. Crew, kitten heels, Lucky, mom blog, mom fashion blog, mom fashion blogger, mommy blog, mommy blogger, mommy fashion, mommy fashion blog, mommy fashion blogger, net-a-porter.com, Patch.com, Rag & Bone, Ralph Lauren, rocketshell.com, saint laurent, slip on sneakers, Spring fashion, Spring trends, style editor, suburban fashion blog, suburban fashion blogger, Suburbs, Theory, Veronica Beard, wool by reversecommuter. Bookmark the permalink.